My church recently added a new audio/video system, for the benefit of the elderly and hard of hearing. While we did not go to quite the level of detail as this guy, we did paint the screens for our projectors onto the wall instead of buying fabric screens. We did it in highschool too for a computer lab we built — but, at home? Well, it’s his damage deposit. Did you add inductive loops for hearing aids? They can be very useful, and pretty easy to do. I’m pleasantly surprised … I honestly wouldn’t have thought off the shelf white wall paint applied with a roller would provide such a sharp and consistent reflection! Clicking on the first link in the article I get a page saying “This Connection is Untrusted”, what’s going on there? Also I discovered browsing the comments on this site with a touchscreen device makes it all too easy to accidentally press the “report comment” button when swiping the screen to scroll up/down, I accidentally pressed it on two comments a few minutes ago, oops! Shouldn’t the report comment function be a two-tier system where you have to confirm you’re reporting the comment like most sites? Where do i go to get plasting beads? I can only find blasting beads, or is that yet another typo? My 7 year old spells better than you. Your mom must be so proud. Who pissed in your corn flakes? Geez. Sure, there were a bunch of typos. But let’s not stoop to the personal. I agree with Dave, honestly it seems that all of his posts have spelling mistakes. It’s like he purposely does it. This is the 21st century (no, not the insurance company), we have spell check! Use it! @Willy: Dave had a point, but he lost his grip on it when he took the comment personal (“My 7 year old (…) Your mom must be so proud”). That’s what I’m objecting to. Effective communication means addressing the issue without throwing in abusive comments. A little editorial effort will result in an infinitely better experience. As others have pointed out, there are numerous typos in the a summary and title. Poor spelling leads one to believe you have little regard for your position and gives an overall impression you are a dunce. Poor grammar is generally accepted as long as the reader believes you know the meaning of the words you use, however there does seem to be a knee point where intelligibility is impaired. You may be an incredibly intelligent and bright person, but unfortunately the world will judge you by your words, it is important that you take more care in your posts. Readers do not expect New York Times editorial skill, however they do expect more than has been demonstrated. Links that lead to the right place would be welcomed too. Before you build, look online. I bought a cinema grey 82″ powered 16:9 screen for $40.00 shipped and it’s new in the box. did not have the controller but two relays fixed that. there is SO MUCH surplus in screens out there you are better off buying than building. But then you have to mount the screen somehow with ceiling or wall hooks and it generally looks less like a part of the interior. Yeah, you really wanna’ look around first. 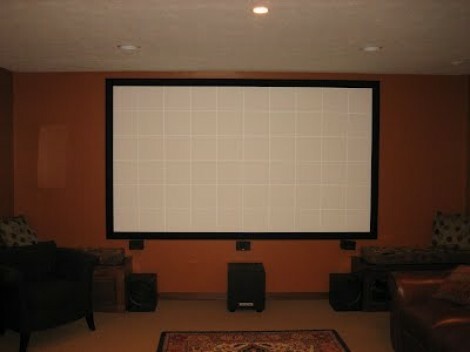 I got my powered Da-Lite screen for $100.00 from the classifieds. When I rolled it down all the way I was surprised to see a Horizontal seam, and another screen. It might have been a custom order screen from da-lite, I’m not sure. I cut it on the seam, and re-worked it. Now I have two screens, motorized and hanging 142″ theaters baby! My projection room has white walls. I have always just shot onto the wall with no screen or special paint. Ten years ago the projectors were just barely bright enough to pull this off with blackout blinds etc. Thew newer projectors have many lumens to spare though. Whenever someone “new” comes over to watch a movie, they usually ask “where is the TV?”, as the couch faces the entertainment center, and above it is a blank wall where most people expect the TV to be. The projector is ceiling mounted and not terribly noticeable, even the contractor who installed my U-Verse didn’t spot it till I turned it on. Nice work … if only there was something worth watching on TV or a movie that isn’t yet another bad remake. not sure if it would be better, but there are additives for paint, microspheres, or radiant or thermal barrier, that would be more expensive, but may give better results than blast media, and its considered “nano-tech” and that just sounds cool. they can be purchased in dry form and are made to add to paints, will flow better than blasting media. not sure if they would work any better, or at all, as they are primarily an insulator, but do add reflective properties. neat project, looks really nice. Not to be a negative Nancy because this is a good DIY project but I’ve built my own already and there are a few different ways you may want to go about this. 1) If you own a home like I do you may not want to go this route. I used some drywall with 3 equally spaces horizontal stand offs (3″x1″) so I could pick up a couple studs I then mounted some 10′ sheets of drywall to that, cutting off the extra and matching my screens ratio and added about 4″ on all sides for the felt. I then used joint tape and joint compound and feathered it out at least 12″ out. This took maybe 4 applications followed by sanding. It was annoying but worth it in the end. This way, if I ever sell the house I just have to take it down and fill in some screw holes. 2) There is actually a little better way of doing this if you are going to do it on the wall like this. Do like the video, but then tape off the area a few layers thick with tape. Go high enough to get over the texture on the wall. You will need lots of drywall mud, but just fill in up to the level of the tape and sand smooth. Either do like the video and make a velvet border or just glue or staple it directly to the wall. 3) Believe it or not, there is a gray color that is best for contrast. Search around some of the Projector forums and you will find different paint recipes involving pure white with a hint of red to make a slight tan color, then add silver craft paint from craft stores like Michaels. There just as many screen recipes out there as DIYer opinions :) but they really are better than pure white. Oh, and adding those micro glass beads was an epic failure. I made many test swatches before I laid paint down and the beads just get covered up with paint and are basically useless. I could maybe see using a clear coat with them. That said, who wants 15lbs of glass beads? lol.